Wi-Fi Direct has become vastly popular in the last few years. Due to its fast network setup and the provision of high transmission rates, it is expected to be the piggyback technology for high speed device-to-device communications in smart cities. 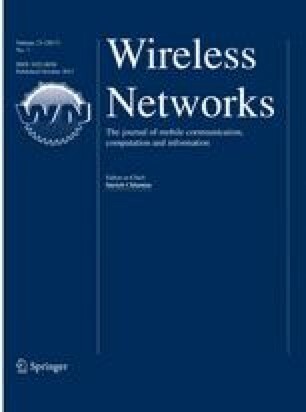 The increasing demand on Wi-Fi Direct networks and its co-location in the same band with other Wi-Fi ad-hoc and infrastructure networks have entailed the need for developing new adaptive techniques to utilize the wireless spectrum efficiently. In this paper, we introduce, analyze and implement a self-organizing algorithm designed specifically for pop-up Wi-Fi Direct networks. The algorithm dynamically changes the operating channels of pop-up Wi-Fi Direct networks according to their performance in a non-cooperative manner. It utilizes the spectrum efficiently, reduces congestion and enhances performance. Moreover, the modified Wi-Fi Direct network running the proposed algorithm is interoperable with all other Wi-Fi network modes and setups and does not affect their functionalities. On the contrary, it enhances their performance implicitly. We implement the algorithm using the driver of RTL8188CUS chipset in a Linux environment and conduct experiments to evaluate its performance. The obtained results illustrate the benefits of using the proposed algorithm. Wannstrom J. (2013). LTE-Advanced for 3GPP. http://www.3gpp.org/technologies/keywords-acronyms/97-lte-advanced. Accessed January 21, 2016. IEEE802.11 High Efficiency WLAN Study Group. Status of Project IEEE 802.11ax. http://www.ieee802.org/11/Reports/tgax_update.htm. Accessed October 15, 2015. Bellalta, B. (2015). IEEE 802.11ax: High-efficiency WLANs. arXiv preprint arXiv:1501.01496. Aruba Networks. Adaptive radio management. http://www.arubanetworks.com/pdf/solutions/TB_ARM.pdf. Accessed January 21, 2016. The Network Simulator NS-2. http://www.isi.edu/nsnam/ns/. Accessed October 15, 2015. Farproc WIFI Analyzer. http://a.farproc.com/wifi-analyzer. Accessed October 15, 2015. GNU General Public License version 2. http://www.gnu.org/licenses/gpl-2.0.html. Accessed October 15, 2015.